hen Yeni Roslaini walks into a room she has a commanding presence. Greeted warmly by her peers and participants, one can hear it in her voice, see it in her smile and feel it in her unwavering resolve. She has earned a reputation as an influencer. When she speaks everyone knows exactly what her mission is: to prevent stunting. The campaign is the National Nutrition Communications Campaign, or NNCC, funded by the Millennium Challenge Account – Indonesia. The goal of the campaign is to prevent stunting, which affects more than one-third of children under 5 years in Indonesia. 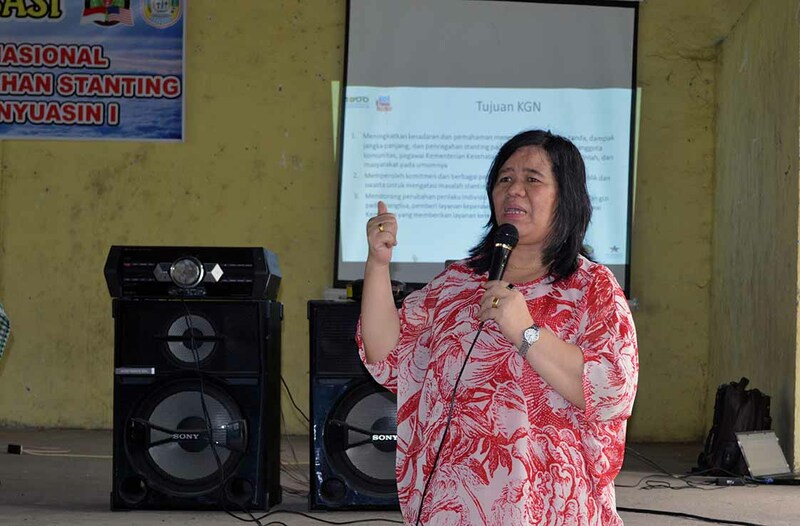 As IMA’s provincial coordinator for South Sumatra, a province located approximately 500 miles from the country’s capital, Jakarta, Roslaini has played a pivotal role in advocating for greater community engagement, government investment and overall awareness in her districts. She is driven not only by her passion for advocacy and using her voice to bring forth the plight of vulnerable children and women in her community but also by her vision for a brighter future for her country. Stunting, or stanting in Bahasa Indonesia, is defined as a child that falls at least two standard deviations below median height for age. It has significant long-term implications for overall health, physical and cognitive development and longevity. Roslaini is right to be concerned. The economic productivity of Indonesia is very much at risk. Economists with the 1,000 Days campaign estimate that stunting can reduce a country’s gross domestic product, or GDP, by as much as 12 percent. Even though Indonesia has officially risen to status as a middle-income country, the prevalence of stunting challenges its economic growth. Although stunting is preventable, it is irreversible. In rural parts of Indonesia, such as villages in South Sumatra, the number of stunted children is even higher than the national estimate. However, Roslaini’s work – and that of the NCCC – can prevent the next generation from experiencing the same fate. That’s why Roslaini, and others like her, plea with government officials–from the national level down to the village level–to invest in efforts to prevent childhood stunting. 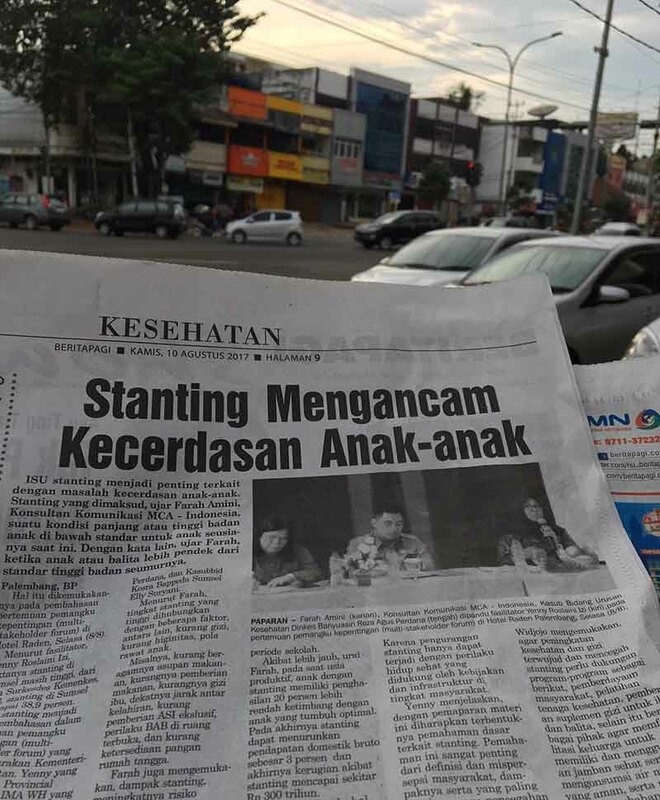 “There have been efforts to prevent stunting at all levels of government but they never really worked,” MCA-Indonesia Campaign Manager Farah Amini says. The hope is that a well-coordinated, comprehensive, national strategy with buy-in from all levels of government could eliminate stunting and ensure the health and well-being of the next generation. Roslaini knows she must keep working to reach as many people as she can with information about ways to prevent stunting and why it is so important. But if she can get one mother, one village head, one midwife and one district official to heed her message, then she knows that at least one child in a population of nearly 7.5 million in South Sumatra will have the chance to reach full potential. For Roslaini and her dream of a brighter future, that’s a win. Roslaini and Amini featured in a local newspaper article following a panel discussion on stunting.